Bronchial asthma, Chronic bronchitis, Emphysema. Sultolin® tablet: 2-4 mg tablet 3-4 times daily. Sultolin® SR tablet: 8 mg tablet twice daily, Sultolin® syrup: 1-2 mg 3 to 4 times daily. Not recommended below 2 years of age. Sultolin® 100 Inhaler : 2 puffs 3-4 tomes daily. Sultolin® Cozycap: 1-2 Cozycap may be administered as a single dosage. The usual recommended dosage of Sultolin® Cozycap for inhalation for adults for maintenance or prophylactic therapy is the contents of one 200 mg capsule every 4 to 6 hours using a Cozyhaler device. 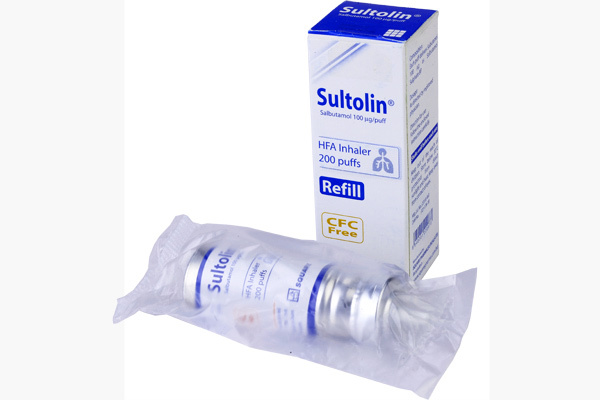 Sultolin® 100 inhaler : Each canister contains salbutamol BP 20 mg(minimum 200 puffs). Each puff delivers salbutamol BP 100 µg.